We can all agree that having data is good. Having data stuck behind an interface is not good. Data in the interface isn’t easy to manipulate. This makes more difficult to analyze and incorporate your data into a tool or template. 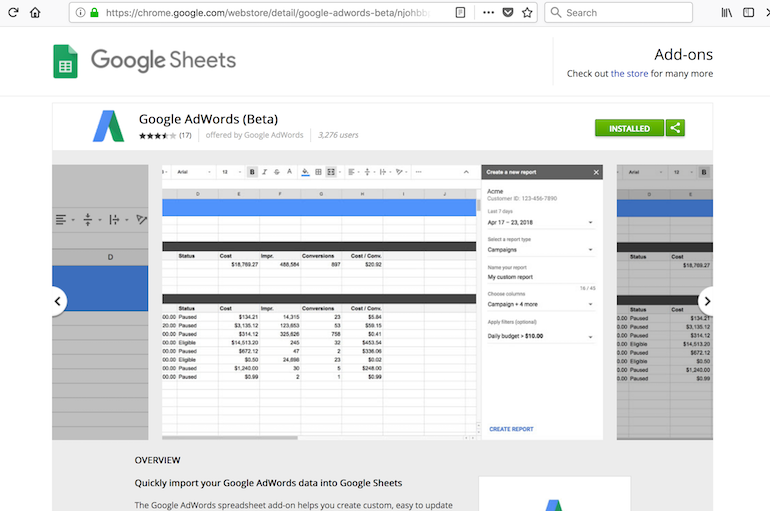 Thankfully a new add-in has come along to save the day and directly export data from AdWords into Google Sheets. Of course you could have pulled this data with a script or third party service but now you can skip script installations and skip extra payments and remove a few extra requirements from your day. 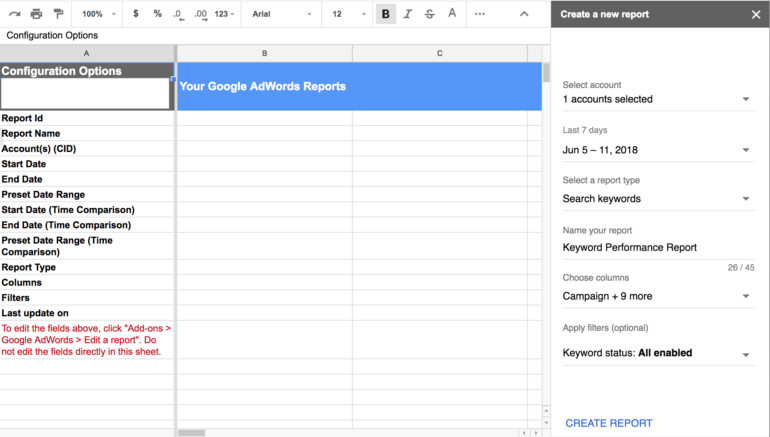 In this article we will walk through the set up for the AdWords add-on for Google Sheets and move along to new projects. You can find the plugin via the chrome add-in. Simply install it, authorize the plugin and you are good to go. Linking your account is as simple as providing your login information and authorizing the plugin to access your AdWords accounts. It’s very similar to the same popups you see with scripts, plugins, or linking other services to an account. If you link an MCC, you’ll have access to all accounts in the plugin via that login. Navigate to the Add-ons menu in sheets and create a new report. Select your account(s), name your report, select report type, metrics, campaigns, and apply any filters you’d like. Save and run the report. The data will be generated in a new sheet with the title of the report. What if you want to create new reports? The configuration shows that little lock making it look like you are stuck with it. Thankfully you do not have to create a new workbook! Navigate back to the Add-ons menu and start creating a new report. This will set up a new configuration sheet, without changing your original configuration and allowyou to house multiple reports in one workbook. Having data is nice, having it refresh with more recent data is even nicer. 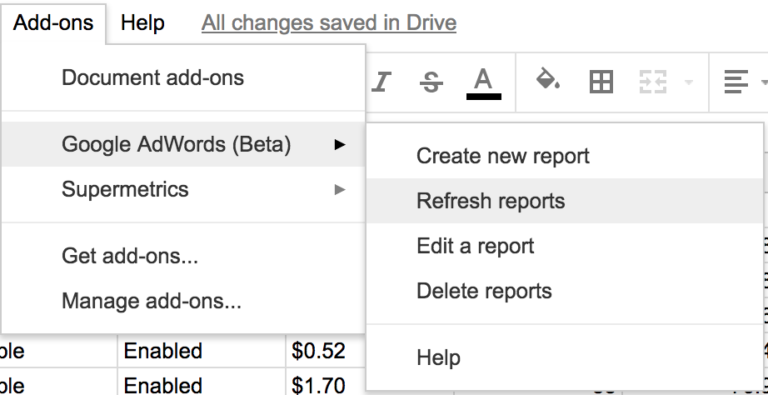 You can refresh your reports at any time via the Add-ons menu. You can select one or more reports to refresh. If you want to update your last seven days report but leave last month’s data alone, you are not forced to update all of them at once. Simply toggle the checks and you are good to go. The add-on will print an error if an error pops up. This includes a sheet can’t be created, the data pull failed, or the report was not successfully completed. You can find this information at the bottom left of the configuration sheet. It’s not immediately obvious sometimes which is why I mentioned it here. You’ll have access to most AdWords columns in the add-on. This means you have access to bid simulator numbers, impression share, quality score factors, and all those other pesky metrics you go back and forth adding to columns when you download reports. If you have not been using the Query function, you should. The query function allows you to return rows, filter, and perform basic operations on a table. All of this happens in one line. Let’s take a simple example and say we want to monitor any keywords with a certain number of impressions and clicks. Yes this a silly example but if you grasp the mechanics you can scale up to handling SQRs, bids, and all sorts of data manipulations. 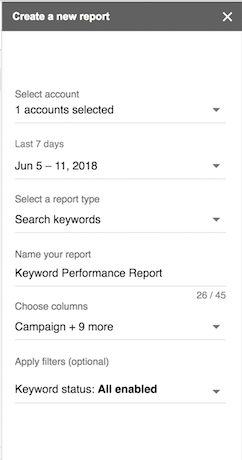 Using the add on to pull search term data, we can set up a new sheet with conversion and cost thresholds, write a query, and return the best and worst performing keywords. 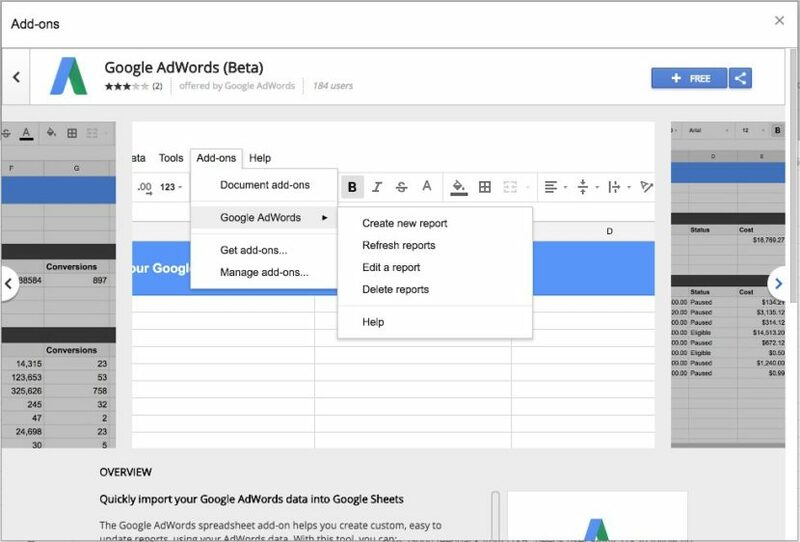 This plugin allows you to pull any AdWords data, meaning you can easily feed it back into a template or tool. This could be for basic analysis, like analyzing your quality score factors. You could also use it to automatically calculate your keyword bids. Once you’ve done that you can connect a simple script to upload the changes and have your own bidding platform! You can also pull multiple accounts at once to streamline reporting, monitor the health of a group of accounts, and keep track of global spend. Anything spreadsheet or process related can be upgraded by using the new add-on to handle the data import.